Celebrating her 90th birthday in 1899, the Plainville Times wrote that my fourth great-grandmother Mary Ann (Miser) Benedick was immensely proud that, "Her sons were all loyal defenders of the Union during the rebellion." Mary's son Samuel Benedick served in the West Virginia Volunteer Infantry. On August 9, 1862, at the Battle of Cedar Mountain, he was injured when Union forces attacked the Confederate regiments under Stonewall Jackson's command. Samuel reported that, during this battle, he was shot in the back of his right arm between the elbow and shoulder. He suffered permanent disability as a result, which he used as justification when he petitioned for a military pension. Samuel Benedick summarizes his war injuries to justify his pension claim. 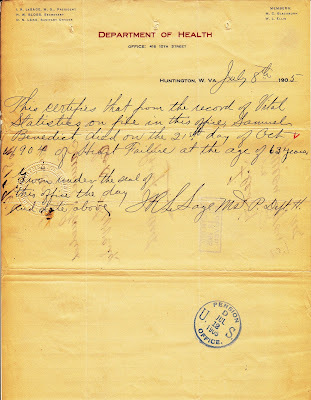 After the war, Samuel and his family settled in Guyandotte, West Virginia where he had worked at the American Car & Foundry Company as a lumber inspector before applying for his pension. He was "held in high esteem" in his community, but that came to a mysterious end in October 1904 - more than a century ago. Early in the morning of October 21, 1904, police in Huntington were notified that a drunken man was passed out in an alleyway. Upon arriving on the scene, an officer quickly determined that the man was dead. "The officer hurried to the place and when he attempted to wake the man whom he thought was in a drunken stupor, discovered that he was dead. A close inspection was made of the man's position, as he lay in the alley and of the surrounding ground. The inspection revealed the fact that the man had been dragged to the place where he lay, for the ground in the alley showed signs of being plowed up by the heels of the man's shoes, while his coat was wrinkled up under his arms, which indicated that his assailants had a difficult job to drag their victim to the secluded spot." The coroner examined the body and found no obvious signs of physical injury. Still suspicious, the police chief initiated an investigation because "all indications pointed to the fact that the man was murdered." At around 7:00 pm, Samuel was seen in the company of five women sharing drinks at Lou Davis' saloon at the corner of Third Avenue and Eighth Street. At 9:30 pm the women reported that they left Samuel and he "was very drunk." The police chief suspected that poisoning was the culprit and ordered an autopsy to examine the contents of his stomach. Samuel's family refused. The Herald Dispatch wrote that "they were satisfied that Benedict (sic.) came to his death from an over indulgence of whiskey..." and that he "...was in feeble health and that they expected death to overcome him at any time." "The theory of the police however is that the man was drugged and robbed, as he was known to have between thirty and forty dollars in his pocket last evening when he met the women. It is believed by the authorities that in drugging the deceased he was given an overdose which resulted in his death. The victim was then dragged to the alley where he was deserted. No money was found in the man's clothing or anything by which he could be identified. This leads police to believe that the man was robbed of his money and other belongings." In the paper's October 24th edition, it was revealed that the police had expanded the timeline. "Within the last twenty four hours, evidence has been secured which revealed the fact that the dead man had been seen at midnight on the fatal night, in company with a certain suspicious woman, whose name the police refused to reveal at this time, but on whom they are steadily piling up evidence which, it is stated, will bring out sensational developments and perhaps prove a case of murder against the woman." The woman in question, it was revealed, couldn't keep her story straight during questioning. "It was learned last night that Benedict (sic.) and the woman were seen at the corner of Third Ave. and Seventh St. shortly after midnight and that the woman introduced the deceased to a confederate, who is now under surveillance. The two induced Benedict to go to a restaurant for a bowl of soup, and, after considerable persuasion, Benedict accompanied them to the restaurant..."
There were witnesses who reported seeing the three individuals after their meal around 1:00 am, and Samuel was "sober at that hour." The Herald Dispatch's October 25th issue is the last I've seen detailing the investigation. In that edition, the police chief remained "hard at work" on the case and was speaking with witnesses "who have revealed considerable important and damaging evidence against two notorious women." The police chief was adamant that he would find the culprits, insisting he would "ferret out this case if it took a year to do it and to bring the guilty parties to trial, notwithstanding the protests made by the family of the deceased." Who was the mysterious Confederate with whom Samuel was persuaded to dine and was now under surveillance? Was the investigation ever solved to the police chief's satisfaction? 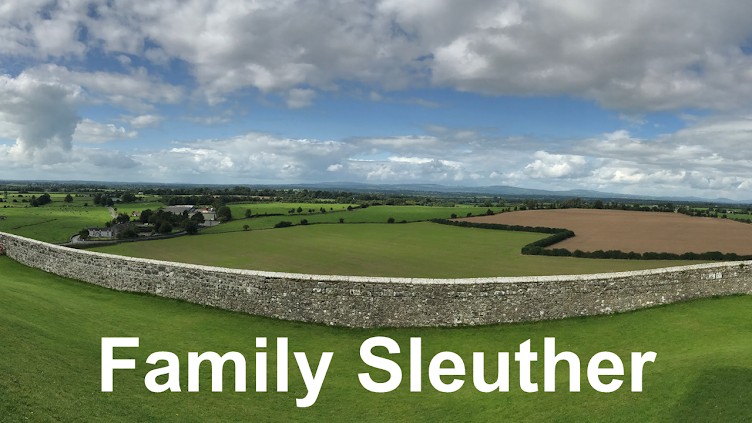 Why did Samuel's family protest the authorities' investigation into the circumstances of his suspicious death? Were there behaviors his family didn't want surfaced in the newspapers? Did they really believe he drank himself to death? What about the witnesses who said he was sober at one in the morning? 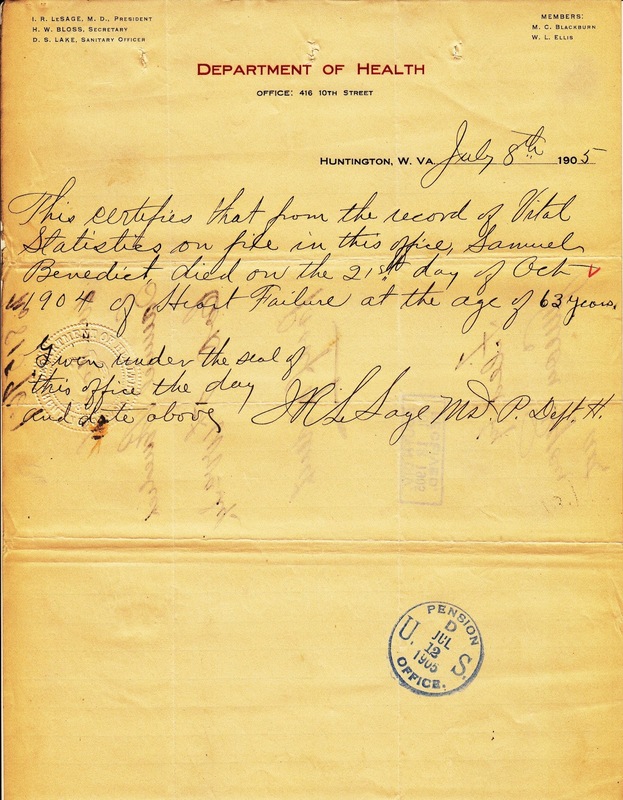 Samuel's pension file includes a handwritten note from the Huntington Department of Health, which stated - nearly nine months after his death - that he succumbed to heart failure. There was no indication that the wounded Civil War veteran was the victim of a sensational crime. Was it all much ado about nothing or was something sinister swept under the rug? I only have transcribed copies of the Herald Dispatch articles cited in this post. I haven't located digitized copies of the newspaper to follow the investigation to its conclusion. Interesting story, Michael. The suspense....I hope you turn up more and can tell us the rest of it! You and me both! I'll keep you posted. Quite a mystery! I hope you can find something that sheds more light on the cause of his death. I'm hoping there was more information in later editions of the newspaper. I need to track down the archived copies.